The winner of the 2001 Electronic Literature Award for poetry, Cayley's windsound is a long digital poem in QuickTime format that demands and rewards patient concentrated reading. Heather McHugh, the judge of the competition, remarked that windsound "reveals the power of letters, even as it plays with the limits of literal intelligibility" and "explores the power of sequences, even as it plays with non-sequitur." 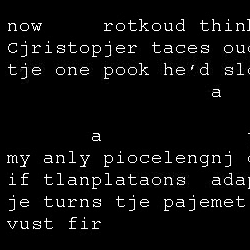 Author description: windsound is a 23-minute text movie animated by transliteral morphs from one "nodal" text to another (textual morphing based on letter replacement). The morphs were software-generated, and, in the original version, speech synthesis was "live." This QuickTime rendition is, basically, a recording of the work's performance in its current state. The nodal texts of windsound were written expressly for the piece. Cayley's translation of a classical Chinese Song-period lyric, "Cadence: Like a Dream," by Qin Guan (1049-1100) is also used. Instructions: To hear the sound, turn on the computer's speakers or plug in headphones. windsound is a QuickTime movie and does not require any action from the user. Previous publication: windsound was first issued as a standalone HyperCard application for Macintosh computers in 1999. It has appeared in a number of versions since and has been accessible for download from http://www.shadoof.net/in. This is the first cross-platform rendition, January 2006.